Foot problems can make our daily lives miserable. Simple, seemingly small issues can become significant without proper care. It's always wise to have your feet checked at least once a year. Getting ready for the Houston Marathon? Playing basketball at the gym? Or maybe you're a star athlete at Seven Lakes, Taylor, Katy, Made Creek or any other stellar school in the area. Whatever your athletics specialty, the most common sport’s injury is Achilles Tendinitis and I promise, it’s best to avoid it, if not, get it treated ASAP. If strained too far and too hard the tendon will rupture. Then the only way to fix it is with surgery. The Achilles tendon is the largest and strongest tendon of the body. It is the most commonly injured or ruptured tendon usually due to a sports injury. Excessive strain and overuse causes inflammation of the tendon. Improper shoe gear or lack of foot support. Inflexibility due to improper stretching technique. Trauma caused by a sudden/hard contraction of calf muscles. Ice massage and contrast baths. Strapping of the lower leg. Orthotic inserts and/or protective shoe gear. Resting from activities that exacerbate the injury. The best prevention is to consult Dr. Burdge prior to initiating a rigorous athletic program. Make sure that your shoe gear is in good shape, and appropriately supportive for your feet. For most people it’s beneficial to have custom orthotics (shoe inserts) – especially runners and those who are constantly putting pressure on their feet. Always stretch before and after activity and when your body does hurt, pay attention. Pain is your body’s way of letting you know something is not right. It’s not always best to ‘push through’ the pain. Ever see a big bump on the side of the foot? Usually it’s near the base of the big toe, but sometimes bumps of the same kind can form at the base of the little toe too. Either way, those bumps are called bunions. They’re a deformity caused by an enlargement of the joint at the base of the respective joints. They form when the toe shifts out of place. Of course, the problem with bunions is that they cause painful friction in footwear. Eventually, the big toe can angle so much it overlaps into the other toes (called Hallux Valgus), or it might rotate or twist (called Hallux Abducto Valgus) causing more irritation and inflammation. Once the toe crowding begins, other toe deformities, such as hammertoes can come into play. As you can imagine, bunions can be very irritating and painful. With every step, as the joint repeatedly flexes, the bigger the bunion gets, the more it hurts to walk. Inside shoes the skin grows more red and tender. If left untreated, bursitis or arthritis may also cause further problems. The flesh on the ball of the foot may thicken. Something as simple as everyday walking may become difficult, which ends up as chronic pain. The leading cause of bunions is wearing shoes that are too tight. Yes, those high heels women love are often the guilty parties. Although bunions are not hereditary, they do tend to run in families. Usually this is due to foot structure reasons. Other contributors can be foot injuries, flat feet, neuromuscular problems, and pronated feet. If you have flat feet you were probably born with them. They are a common condition, due to foot structure. While walking the ankle bones lean inward, collapse or pronate, so the arch collapses. It’s easy to see if you look at a pair of shoes which have been repeatedly worn by someone with flat feet. When placed side by side at the heel they will lean toward each other. In many instances, flat feet don’t cause pain or problems. When there is pain, however, it’s a sure indicator that the situation needs to be evaluated. That pain can be in the foot, ankle, or lower leg, and should be monitored especially in children. Painful progressive flat foot, also known as tibialis posterior tendonitis or adult-acuqired flat foot, is related to inflammation of the tibialis posterior tendon. This may occur when the tendon is stretched, torn or damaged. If unaddressed, chronic pain and disability may follow. Those who have flat feet or an abnormal attachment of the tendon to the bones in the midfoot are more likely to have tibialis posterior tendonitis. There are many conservative treatments for painful flat feet including anti-inflammatory medications, icing, supportive taping, bracing, physical therapy and custom orthotics. Steroid injections can be administered to reduce inflammation as well. Ultimately surgical correction may be needed. Gout can be extremely painful and come on suddenly. Usually it will affect the joint at the base of the big toe, which will become inflamed, tender and swollen. This is caused by high levels of uric acid in the blood which have caused crystals to form. Those crystals accumulate around the joint, inflicting a great deal of pain as the pressure builds. Sequences of gout can last from hours to days or weeks. Once you’ve had a gout attack, it’s fairly certain you will have more in the future. In general men are more likely to have gout problems as opposed to women, and for both men and women, it doesn’t usually strike until one is at least middle-aged. Once a gout attack happens, it helps to drink lots of fluids, ice the area, take anti-inflammatories and, if you’re still in pain, contact our office. Often the pain is so extreme, it’s best to contact the doctor first. Prevention is the best route to take when it comes to gout. A significant part of that has to do with your diet, fluid intake and weight. In general, the diet rules follow the usual guidelines. Eat fruits, vegetables, and whole grains. Avoid refined flour, sugar, cakes, candy, sweetened beverages and products with high fructose corn syrup. Cut back on saturated fats and limit daily proteins from lean meat, fish and poultry to 4 to 6 oz. a day. Regarding the fluids, uric acid is flushed out with your urine. One of the best ways to make sure things are getting flushed clean is to drink plenty of water. As far as weight loss and control is concerned, there are countless benefits, including reduced strain on all your organs and joints. Studies have shown that weight loss alone significantly reduces gout in at risk patients. There are a number of things that can cause ingrown toenails. Sometimes it’s due to the nails being trimmed too short, especially on the corners – cut at a curve instead of straight across. In other instances it’s due to shoe gear or pressure within shoes. Either the shoes are too tight (lacking in width, length or both), or the individual is engaged in activities that cause excessive pressure that force the nail into the side of the toe. They can also be due to an injury, fungal infection, a hereditary trait or even poor foot structure. Whatever the cause, the nail grows inward, into the skin, causing pain and inflammation. At one point or another most people have had an ingrown toenail. Initially, they are hard, swollen and tender. If the cause is not removed and the problem left untreated, an ingrown toenail can become blistered, sore, red and infected. Skin may begin to grow over the nail, making the problem even worse. Often treatment is simple. First figure out the cause, and remove it if possible, that would include the avoidance of wearing tight shoes and/or socks. Foot soaks several times a day in warm, soapy water are helpful. If an infection is present, sometimes antibiotics are prescribed, but remember, always check with your doctor before taking any medication. If a serious infection sets in, or the pain is severe, surgical removal of the ingrown segment of the nail may be necessary. We all have our clumsy moments. Even those of us who are elegant and graceful can be prone to something as simple as an ankle sprain. One tiny slip off a curb, a stair, a rock, even a small stumble that causes excessive twisting of the ligaments and tendons that support the ankle can cause a painful ankle sprain. The degree of the sprain determines the type of treatment required. The tricky part is, if the sprain is not treated properly, the injury could cause long term problems. For treatment it is important to apply ice and compression immediately after the injury. Seek medical attention to assess the degree of the injury. This may include x-rays to determine if a fracture has occurred. If you wish to heal as quickly as possible and avoid long term problems, it is important to receive proper care right away. What are corns and calluses? Basically, they’re areas of thick skin that are a result of constant pressure and repeated friction. The difference between a callus and a corn is that a callus is on the bottom of your foot, and corns are on the top. Both can be very painful. High-heels – the high shoes put more pressure on the ball of the foot and toes, causing friction where the shoe comes in contact with the foot. Sports – activities like running can add extra pressure to parts of the foot. An abnormal walk or flat feet – walking abnormally or having flat feet means the joints are being unnaturally used and thus exposed to excessive wear. Other Foot Issues – hammer toes and bunions where joints jut out unnaturally will rub against shoes, causing hardened skin. If you feel discomfort you should visit our office. Picking at corns and calluses on your own can be dangerous. For those who have diabetes and/or poor circulation, it is vital to have your feet checked regularly. How will your doctor examine your condition? Dr. Burdge takes X-rays. He’ll expertly review your medical history, examine your gait – or how you walk – and the shoes you wear. For individuals who suffer from poor circulation or diabetes, corns and calluses can be serious. In such cases, even if you don’t feel pain, examine your feet often and schedule regular appointments with Dr. Burdge to insure that your feet remain healthy. Houston’s climate is a breeding ground for fungus. All it takes is the combination of darkness moisture and warmth. Unfortunately, unlike Athlete’s Foot, fungal nails are a little harder to treat. In general, fungal nails refers to a range of infections. The mildest manifests as yellowed nails. More severe cases are thickened, crumbling, with debris underneath. If the fungus is bad, the nails will turn black. In the past, the only fix was to repeatedly remove the entire nail, month after month until the fungus was gone. Some doctors still follow this radical, now unnecessary pattern. At Advanced Ankle & Foot treatments include oral and topical medications. A combination is best. You can do foot soaks two times a day, one part vinegar to two parts water for ten minutes in lukewarm water. At our office we also have Pinpoint Laser treatments available. To learn more about our Pinpoint Laser treatments click here. Once you’ve cleared a fungal infection, it’s wise to prevent it from happening again. Wash and dry your feet before bed. Apply a non-prescription anti-fungal cream to the entire foot. Do this every night, then gradually reduce applications, always keeping your feet dry as often as possible, especially after taking a shower or bath. Don’t share nail clippers, files, shoes, socks, etc. with others. Wear absorbent socks (cotton is best). Change often to keep them dry if needed. In public places wear shower sandals or shoes. Hammertoes are a joint deformity in the second through fifth toes. It can be in just one or all of the toes. In any case, the middle joint is bent, causing it to curl or resemble a hammer. Without treatment, the hammertoe or toes can become rigid and require surgery. Often people with hammertoes have corns or calluses where the jutting joint rubs against their shoes or the tip of their toe. The condition can be painful and make it very difficult to find comfortable shoes. Poorly fitted shoes, arthritis and muscle imbalance cause hammertoes. They can be secondary to bunions or other foot conditions as well. The best treatment for hammertoes is shoes with soft, roomy toe boxes. Some pads, straps, cushions and/or non-medicated cornpads may also be helpful. Surgical correction is always an option, but that is always something to be discussed with Dr. Burdge, determined and based on your specific needs. Neuromas are enlarged, benign growths of nerves which are usually between the third and fourth toes. Tissue rubs against the nerves, irritating them until eventually a neuroma forms. Anything from pressure caused by poorly fitted shoes (once again high-heeled shoes can be a factor) to abnormal bone structure can cause a neuroma. Common symptoms include burning, numbness, tingling, and/or sensations of thickness or pain in the ball of the foot. In many instances something as simple as wearing corrective shoes or custom shoe inserts, otherwise known as orthotics can resolve the problem. Cortisone injections are also very helpful. If those conservative treatments aren’t enough, however, surgical removal may be needed. Surgical removal of neuromas can be tricky. The nerves have many tiny tendrils. If all the neuroma isn’t removed, it can return. Over the years, Dr. Burdge has proven to have exceptional skills at removing neuromas in particular. Although there is always a risk a neuroma may return, Dr. Burdge has had no repeat cases. In fact, he’s corrected cases where neuromas have returned for patients who had surgeries in the past performed by other physicians. If you are in need of surgery, Dr. Burdge is the best surgeon for the job. Even though they may be painful, most foot warts are harmless. Quite often they are mistaken for corns or calluses, roughened spots of skin due to pressure and rubbing. Warts, on the other hand, are caused by a viral infection. Unlike corns and calluses, which are flat, warts are usually raised and fleshy. They can appear anywhere on the foot or toes. Sometimes they will disappear for a short while on their own, only to reappear later, recurring in the same location. Without treatment, foot warts can grow up to an inch in circumference and may increase into clusters of warts. Teenagers and children are generally more susceptible to warts than adults. Warts that are on the soles or bottom of the feet are called plantar warts or verrucas. Since you are constantly stepping on the surface of your foot, the wart can only grow inward. They become hard, and flat, with a rough surface and feel like you are walking on a pebble or much worse. Often they are gray or brown but the color may vary. The center is clear with one or more pinpoints of black. Similar to other infectious lesions, warts are spread by scratching touching or something as simple as contact with skin shed from another wart. A bleeding wart may also lead to further spreading. Warts in general are resistant to treatment. They tend to recur. Drugstore treatments almost never work because their use tends to inadvertently destroy surrounding healthy tissue. For the best assistance, contact our office. Dr. Burdge knows the best treatment for each patient’s specific needs. Athlete’s foot is a chronic skin infection caused by various types of fungus. The symptoms range from mild itching and scaling to heavy peeling, with red inflammation and blisters. It is often spread in places where people go barefoot like public showers and swimming pools. Most often it begins between the toes or arch of the foot. Eventually it can spread across the bottom and sides as well. Here in Katy where the climate is already so moist and our kids in particular, spend so much time barefoot in public places – like Typhoon Texas, the neighborhood pool, or even splashing in puddles after a heavy rainfall – we need to be vigilant and watch their behavior. Do you see them scratching? Are they complaining? Prevention is best, (like wearing swim shoes and avoiding puddles) but just in case, watch for issues and get them treated before they’re a serious issue. Treatment varies with the degree of the fungal problem. Usually it involves a combination of medication and personal care. Extremely mild cases can often be handled with over-the-counter and prescription powders, lotions, or ointments which aid in treating the scaling, itching, and inflammation. It would be wise, however, to consult Dr. Burdge before taking any medication. In any case, if your Athlete’s Foot doesn’t improve, you need to be seen. If left untreated, potentially severe complications can follow including sepsis and hospitalization. Sitting around waiting for it to resolve itself isn’t wise. Those who suffer from Diabetes already know it is a chronic condition caused by high levels of sugar in the blood. Because of the imbalance it causes, it decreases the body’s ability to fight infections. When it comes to diabetics, this is especially harmful to the feet. If the blood sugars are not properly regulated, organ damage can occur. Immune system impairment is also likely. One common problem with diabetics is nerve damage. With a damaged nervous system, a diabetic may not be able to feel their feet as they normally should. The sweat and oil production that lubricates the skin of the foot no longer functions properly either. Without even realizing it, during normal activity, abnormal pressure can build up on the skin, bones and joints, causing sores or ulcers to develop. It is important to prevent such sores before they become a problem, or if they do occur, recognize them early and get help immediately. Even if you don’t feel any pain, those ulcers can cause serious problems if they are improperly addressed. It is especially important for diabetics to wear proper shoe gear. Often poor shoes significantly increase diabetic foot problems. If you see red, sore spots, blisters, corns, calluses or have consistent pain associated with wearing shoes, it is essential that you get new shoes right away. There are stores which produce shoes specifically for diabetics and often insurances will cover diabetic shoes as long as your doctor writes a prescription. Also, if you have other foot problems like flat feet, bunions, hammertoes, etc., it may be helpful to purchase custom orthotics or shoe inserts in addition to the diabetic shoes to further protect your feet from complications. If you have severe nerve damage diabetic neuropathy or peripheral neuropathy, you probably don’t feel your feet the way you should. It may seem a little strange, but pain lets us know when something is wrong. When we don’t feel the pain when something is wrong, we’re less likely to do something about it. In the case of diabetes, it’s a very dangerous risk, which is why diabetic patients are urged to have regular foot checks regardless of how well they feel. Another line of defense in that regard is to visually examine your feet on a daily basis. If you see anything that seems fishy, get it checked right away. Some additional factors that can complicate diabetic foot problems are: poor circulation, foot trauma, infections, and smoking. It is extremely important to take the threat of diabetes seriously when it comes to your feet. It is the number one cause of toe, foot and below the knee amputations, all of which can be prevented with proper preventative care. Fortunately, Dr. Burdge has had expert training as well as decades of experience in the treatment and care of Diabetic feet. Call our office today to keep your feet on the right track. As our feet age, they often develop problems. Toenails thicken. Joints can become arthritic and cause corns, calluses and hammertoes. Without proper routine care, those problems can turn into open sores, thicker, crumbling nails, and severely deformed feet. Oftentimes the first signs of developing diabetes will appear on the foot as well. The best way to know if you need to come in is A) if you’re having pain, B) if anything on your foot doesn’t look right, or C) you can’t cut your own toenails because they’re so thick. 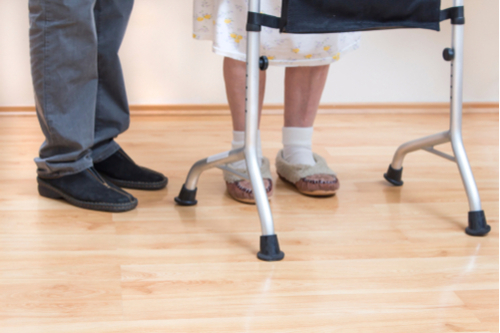 Patients who are on Medicare or Medicare replacement plans are eligible for annual foot checks. Those who meet health condition requirements can come in for routine foot care (like nail debridements) every 62 days. 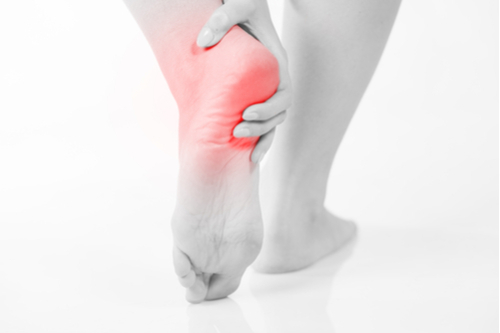 Do you often feel a sharp pain on the heel of your foot as soon as you get out of bed in the morning? Or maybe near the end of the day it feels like there’s a razor slicing across the bottom of your heel. It could even feel like a tear, like something’s being ripped across the bottom of your foot from your heel across the arch. Heel pain is fairly common and is usually due to a condition called plantar fasciitis. The tendons that run from the heel bone to the ball of the foot are being pulled too much, like a tear, causing pain and inflammation. What causes the pull? A collapsed arch. People with flat feet, or those who haven’t been wearing supportive footwear are prone to heel pain. Generally it’s something genetic that can’t be prevented. It can happen at almost any age. There are many conservative treatments for heel pain. Those include temporary shoe inserts, custom orthotics, or custom made highly durable shoe inserts, anti-inflammatory medications, icing, wearing proper shoe gear, no barefoot walking, icing the area and physical therapy. If those treatments are not sufficient, steroid injections can be administered. Ultimately, there are surgical options for permanent correction. In all cases, it’s best to discuss your situation with Dr. Burdge to determine what treatment best suits your needs. At Advanced Ankle & Foot we see a lot of plantar fasciitis and/or heel spurs. Plantar fasciitis is heel and arch pain due to inflammation across the bottom of the foot. The connective tissue which runs from the heel bone to the base of the toes, called plantar fascia becomes inflamed, most often due to over pronation. Essentially, over pronation refers to flat feet. Because the arch isn’t supported, the tendon is strained, eventually causing inflammation. Plantar fasciitis is a precursor to heel spurs or heel spur syndrome. Due to the excessive pull of the fascia, calcium deposits can build on the tendon where it attaches to the heel bone, or calcaneus, forming a kind of hook or spur. Heel spurs can be treated successfully through conservative means. Dr. Burdge may suggest taking anti-inflammatory medications, using ice packs, stretching exercises, custom orthotic devices, steroid injections and/or physical therapy. In extreme cases, surgical correction is advised. Getting Back on Your Feet? Dr. Scott Burdge has been practicing podiatry for more than twenty years. As a Board Certified Surgeon, he is well versed in every foot surgery imaginable. Paperless documentation through eClinical, the #1 paperless documentation program in this region compatible with every major hospital in the area. SmartScan for detecting and monitoring diabetic neuropathy. We're here to help you get back on your feet. If you have any questions regarding ailments or procedures, contact our clinic, or schedule an appointment today.